Apple's promotion that offered a $100 rebate to customers who purchased a Mac and qualifying printer has been discontinued with no alternative incentives announced. In a change to its promotion information webpage on Tuesday, Apple announced that the long-standing printer rebate program has been cancelled, leaving the company without any rebates or incentives for new computer buyers. The Cupertino, Calif., company has traditionally offered some sort of incentive when customers buy a new Mac, such as the $100 instant rebate when purchasing a computer and printer. While the programs were usually "limited time only" affairs, Apple's latest printer rebate was a perpetual offer that stipulated the company could end it at any time. 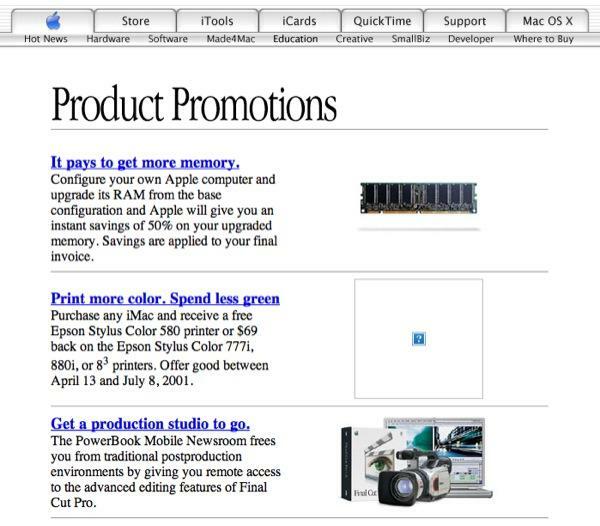 Apple has advertised a $100 printer rebate sporadically from 2001 alongside numerous other discounts and promotions for both hardware and software. The company is also known for its educational rebates and discounts, including the annual back-to-school promotion which has offered free iPods to gift cards. Currently, Apple offers discounts for students and teachers through its Education Store or at Apple Store locations and campuses though the program is more of an institution rather than form of incentive. It is unclear whether Apple is slowly phasing out incentives as the company's online store usually has some type of discount. Currently, the promotion page displays a lone advertisement of the just-cancelled printer rebate.